Few biological cells are as interesting to the electrical engineer as the neuron. 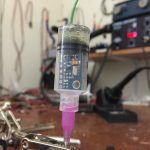 Neurons are essentially capacitors (with a dielectric cell membrane separating conductive fluid on each side) with parallel charge pumps, leak currents, and nonlinear voltage-dependent currents. When massively parallelized, these individual functional electrical units yield complex behavior and underlie consciousness. The study of the electrical properties of neurons (neurophysiologically, a subset of electrophysiology) often involves the development and use of sensitive electrical equipment aimed at studying these small potentials produced by neurons and currents which travel through channels embedded in their membranes. 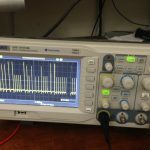 It seems neurophysiology has gained an emerging interest from the hacker community, as evidenced by the success of Back Yard Brains, projects like the OpenEEG, and Hack-A-Day’s recent feature The Neuron – a Hacker’s Perspective. 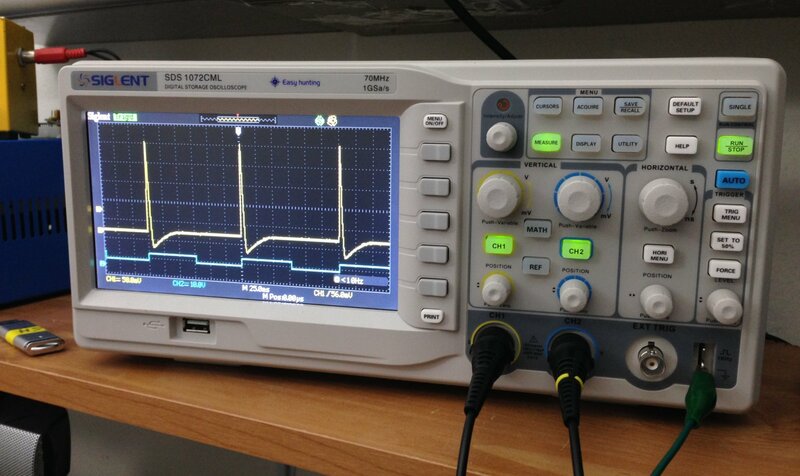 In pondering designs for complex action potential detection and analysis circuitry, I realized that it would be beneficial to be able to generate action-potential-like waveforms on my workbench. The circuit I came up with to do this is a fully analog (technically mixed signal) action potential generator which produces lifelike action potentials. 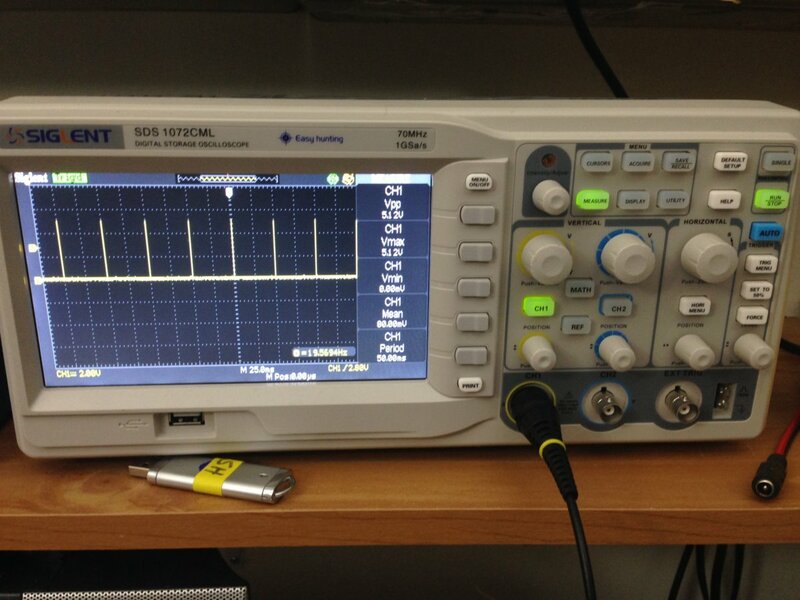 Cellular Neurophysiology for Electrical Engineers (in 2 sentences): Neuron action potentials (self-propagating voltage-triggered depolarizations) in individual neurons are measured in scientific environments using single cell recording tools such as sharp microelectrodes and patch-clamp pipettes. Neurons typically rest around -70mV and when depolarized (typically by external excitatory input) above a threshold they engage in a self-propagating depolarization until they reach approximately +40mV, at which time a self-propagating repolarization occurs (often over-shooting the initial rest potential by several mV), then the cell slowly returns to the rest voltage so after about 50ms the neuron is prepared to fire another action potential. Impassioned budding electrophysiologists may enjoy further reading Active Behavior of the Cell Membrane and Introduction to Computational Neuroscience. The circuit I describe here produces waveforms which visually mimic action potentials rather than serve to replicate the exact conductances real neurons employ to exhibit their complex behavior. It is worth noting that numerous scientists and engineers have designed more physiological electrical representations of neuronal circuitry using discrete components. In fact, the Hodgkin-Huxley model of the initiation and propagation of action potentials earned Alan Hodgkin and Andrew Huxley the Nobel Prize in Physiology and Medicine in 1936. Some resources on the internet describe how to design lifelike action potential generating circuits by mimicking the endogenous ionic conductances which underlie them, notably Analog and Digital Hardware Neural Models, Active Cell Model, and Neuromorphic Silicon Neuron Circuits. My goal for this project is to create waveforms which resemble action potentials, rather than waveforms which truly model them. I suspect it is highly unlikely I will earn a Nobel Prize for the work presented here. 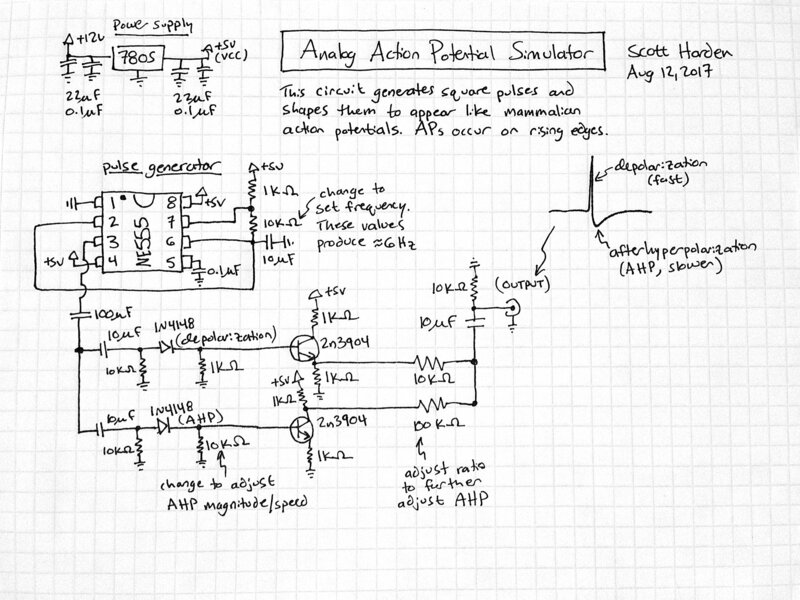 The analog action potential simulator circuit I came up with creates a continuous series action potentials. This is achieved using a 555 timer (specifically the NE555) in an astable configuration to provide continuous square waves (about 6 Hz at about 50% duty). 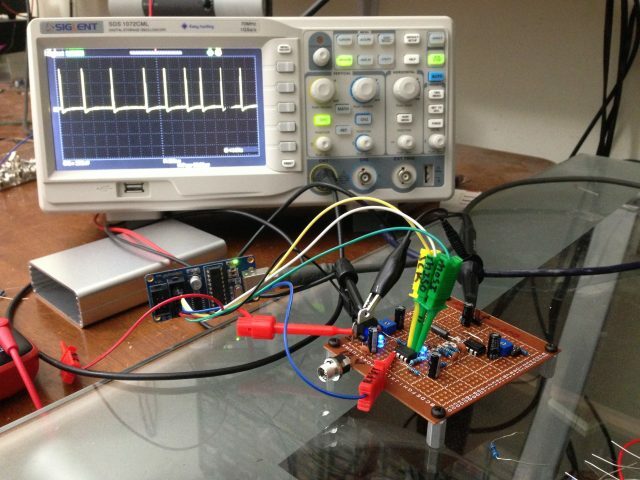 The rising edge of each square wave is isolated with a diode and used to charge a capacitor*. 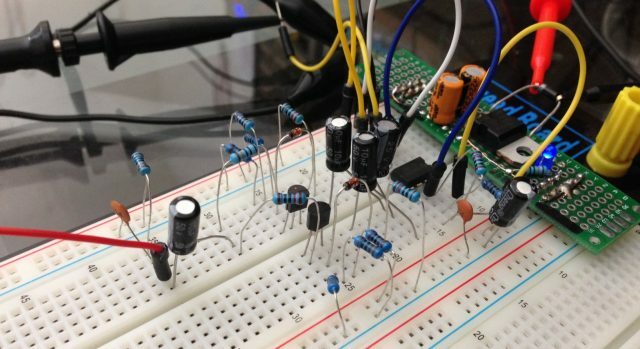 While the charge on the capacitor is above a certain voltage, an NPN transistor (the 2N3904) allows current to flow, amplifying this transient input current. 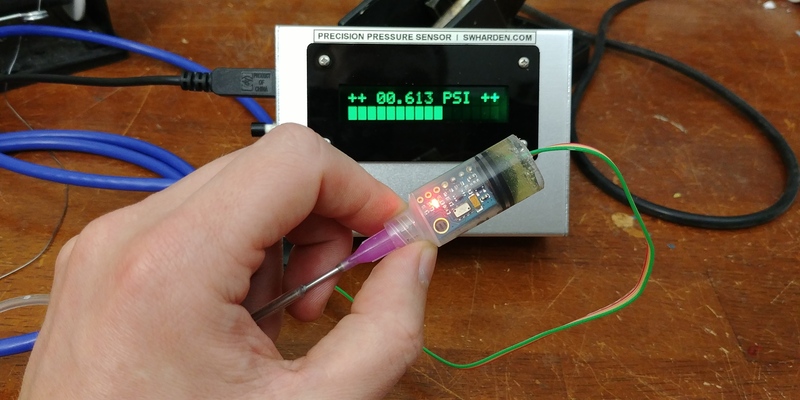 The capacitor* discharges predictably (as an RC circuit) through a leak resistor. 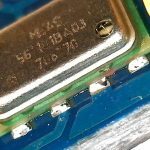 A large value leak resistor slows the discharge and allows that signal’s transistor to flow current for a longer duration. 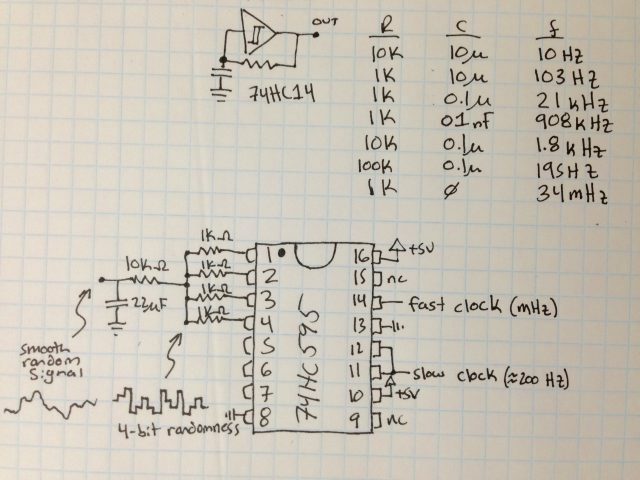 By having two signals (fast and slow) using RC circuits with different resistances (smaller and larger), the transistors are on for different durations (shorter and longer). By making the short pulse positive (using the NPN in common collector configuration) and the longer pulse negative (using the NPN in common emitter configuration), a resistor voltage divider can be designed to scale and combine these signals into an output waveform a few hundred mV in size with a 5V power supply. 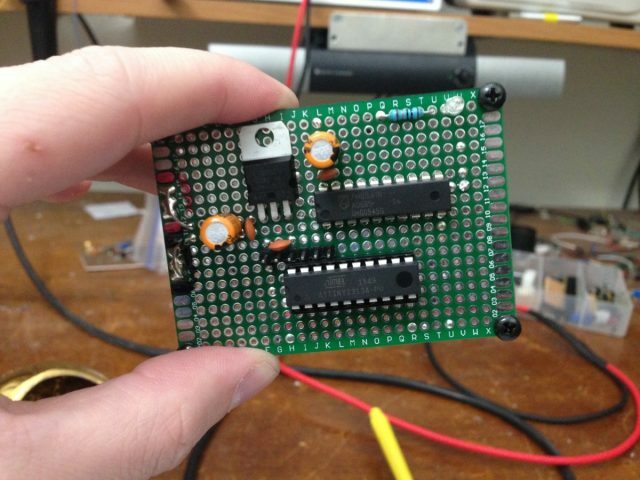 Pictured below is the output of this circuit realized on a breadboard. 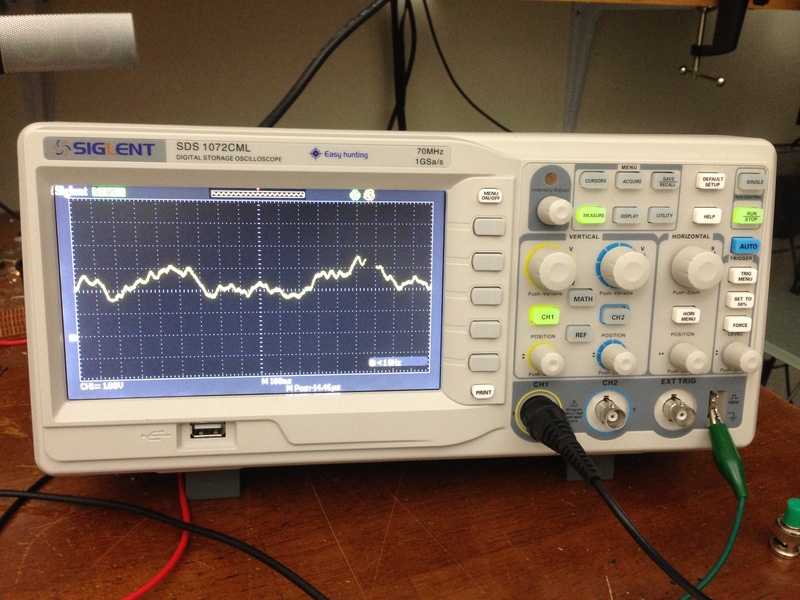 The blue trace is the output of the 555 timer. 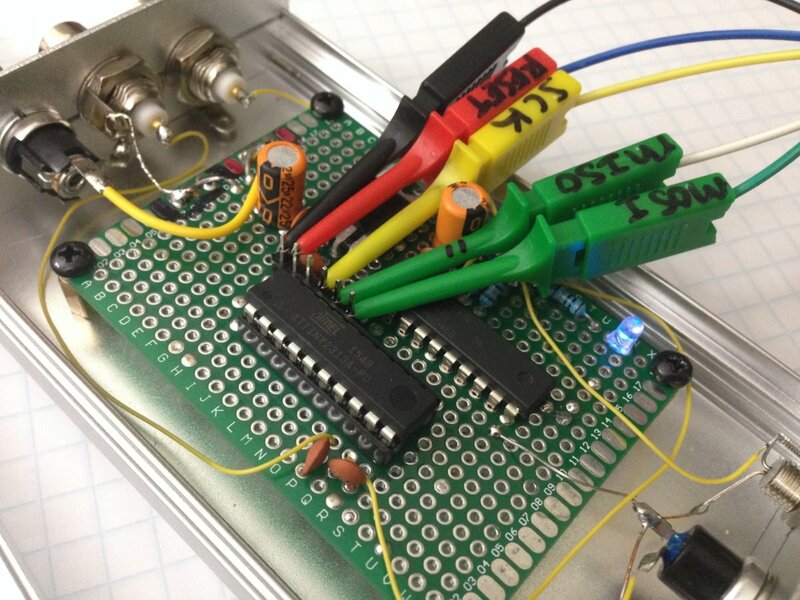 *Between the capacitance of the rectification diode, input capacitance of the transistor, and stray parasitic capacitance from the physical construction of my wires and the rails on my breadboard, there is sufficient capacitance to accumulate charge which can be modified by changing the value of the leak resistor. This circuit produces similar output when simulated. 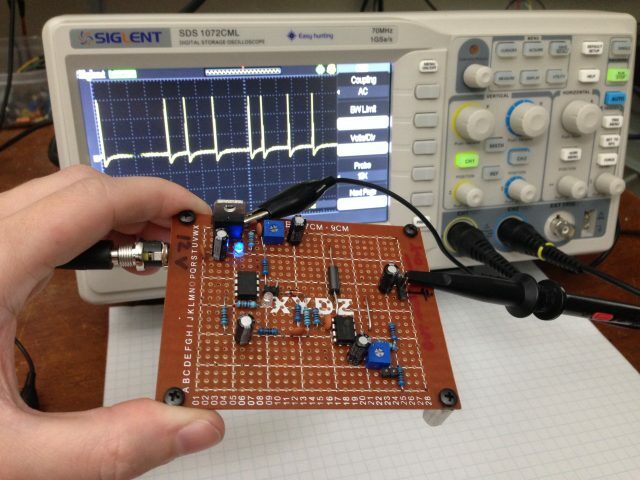 I’m using LTspice (free) to simulate this circuit. The circuit shown is identical to the one hand-drawn and built on the breadboard, with the exception that an additional 0.1 µF capacitor to ground is used on the output to smooth the signal. 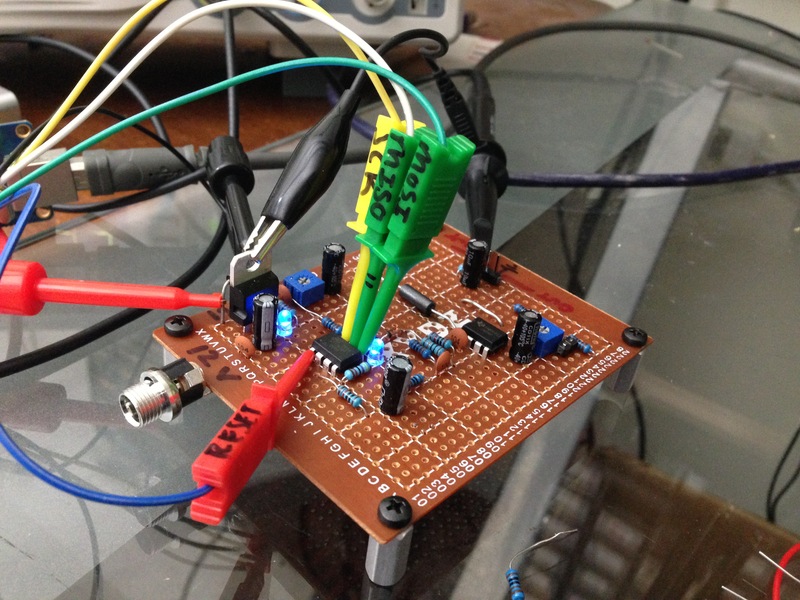 On the breadboard this capacitance-based low-pass filtering already exists due to the capacitive nature of the components, wires, and rails. 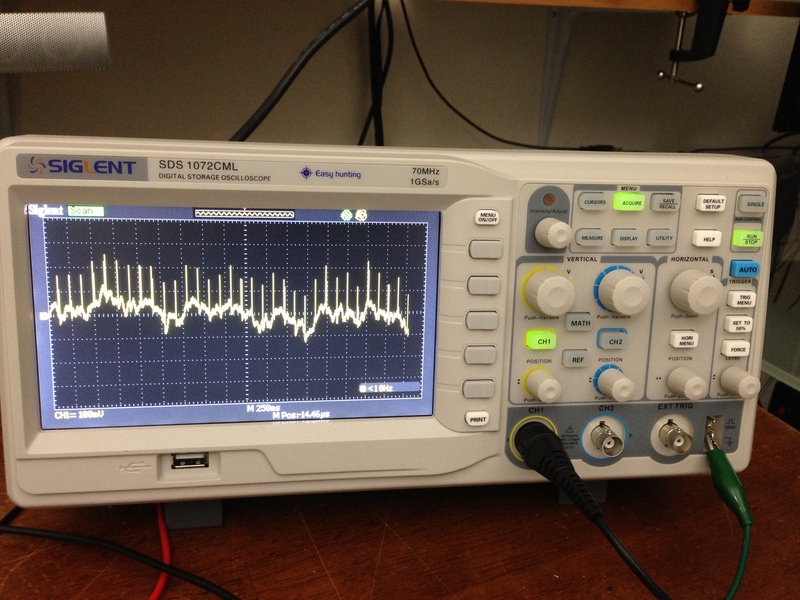 Action potential frequency: The resistor/capacitor network on the 555 timer determines the rate of square pulses which trigger action potentials. Changing these values will cause a different rate of action potential firing, but I haven’t attempted to push it too fast and suspect the result would not be stable is the capacitors are not given time to fully discharge before re-initiating subsequent action potentials. 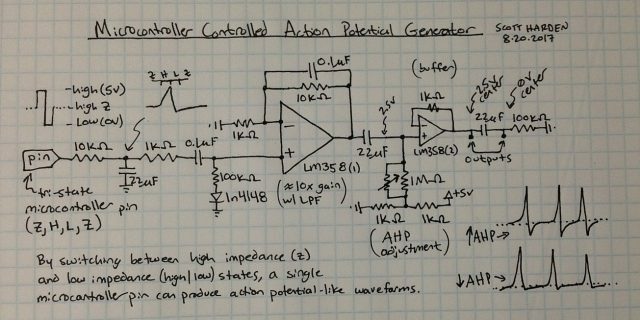 Microcontroller-triggered action potentials: Since action potentials are triggered by any 5V rising edge signal, it is trivially easy to create action potentials from microcontrollers! You could create some very complex firing patterns, or even “reactive” firing patterns which respond to inputs. 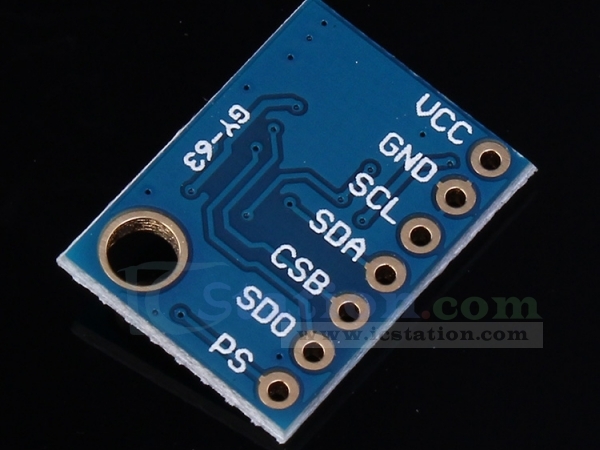 For example, add a TSL2561 I2C digital light sensor and you can have a light-to-frequency action potential generator! Adjusting size and shape of action potentials: Since the waveform is the combination of two waveforms, you can really only adjust the duration (width) or amplitude (height) of each individual waveform, as well as the relative proportion of each used in creating the summation. Widths are adjusted by changing the leak resistor on the base of each transistor, or by adding additional capacitance. Amplitude and the ratio of each signal may be adjusted by changing the ratio of resistors on the output resistor divider. 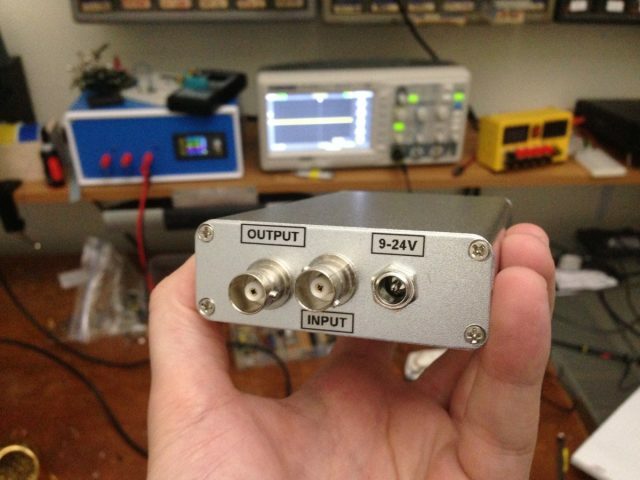 Producing -70 mV (physiological) output: The current output is electirically decoupled (through a series capacitor) so it can float at whatever voltage you bias it to. Therefore, it is easy to “pull” in either direction. Adding a 10k potentiometer to bias the output is an easy way to let you set the voltage. 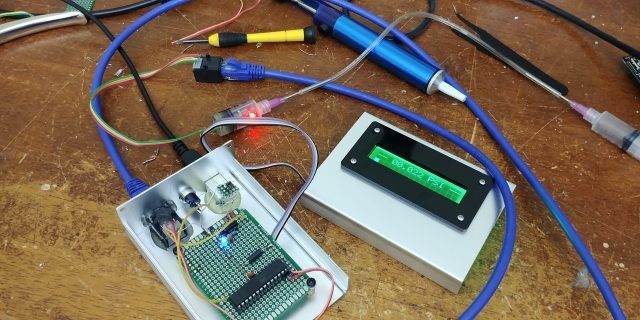 A second potentiometer gating the magnitude of the output signal will let you adjust the height of the output waveform as desired. 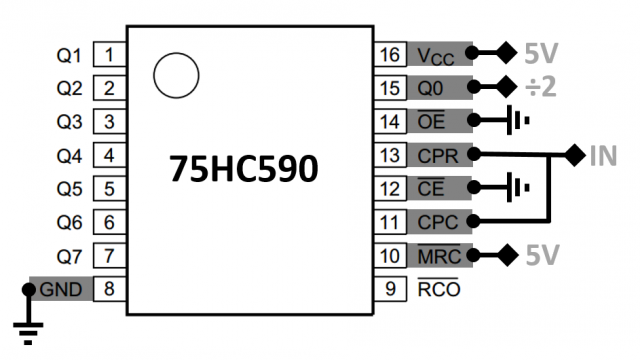 The 555 could be replaced by an inverted ramp (sawtooth): An inverted ramp / sawtooth pattern which produces rapid 5V rising edges would drive this circuit equally well. A fully analog ramp generator circuit can be realized with 3 transistors: essentially a constant current capacitor charger with a threshold-detecting PNP/NPN discharge component. 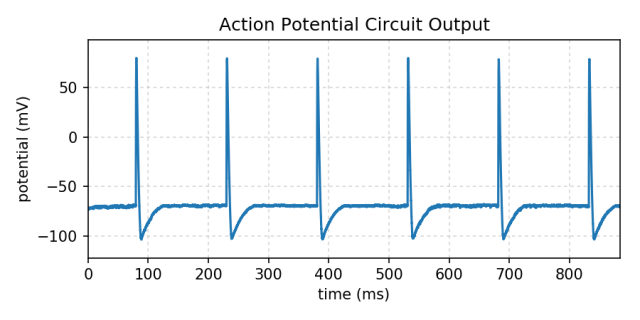 This action potential is not all-or-nothing: In real life, small excitatory inputs which fail to reach the action potential threshold do not produce an action potential voltage waveform. 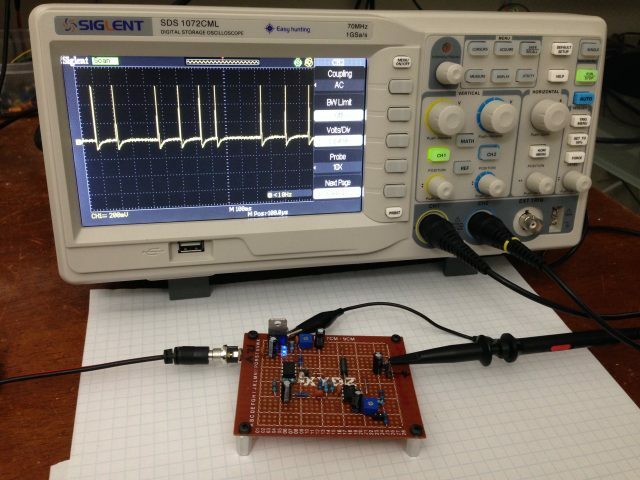 This circuit uses 5V rising edges to produce action potential waveforms. However, feeding a 1V rising edge would produce an action potential 1/5 the size. This is not a physiological effect. 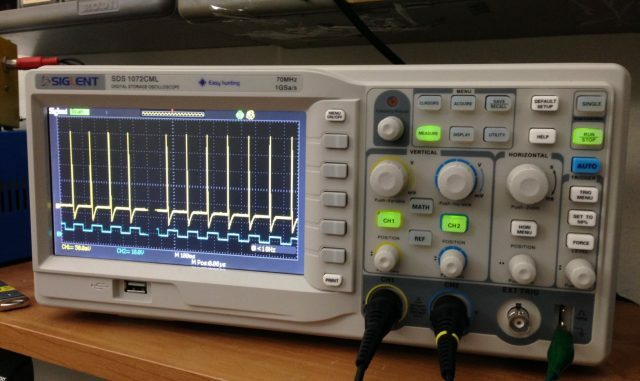 However, it is unlikely (if not impossible) for many digital signal sources (i.e., common microcontrollers) to output anything other than sharp rising edge square waves of fixed voltages, so this is not a concern for my application. Random action potentials: When pondering how to create randomly timed action potentials, the issue of how to generate random numbers arises. 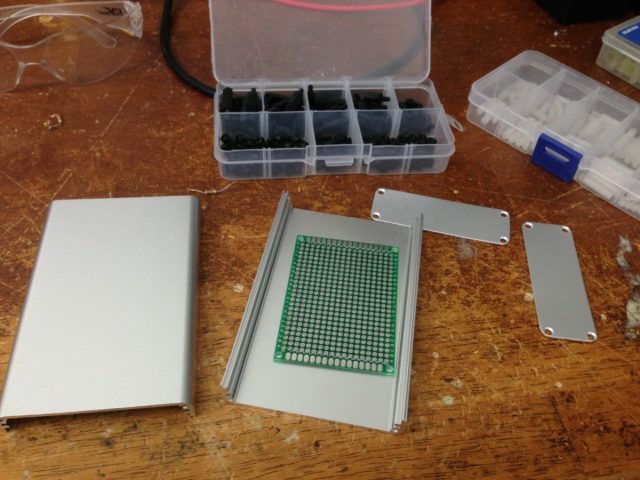 This is surprisingly difficult, especially in embedded devices. 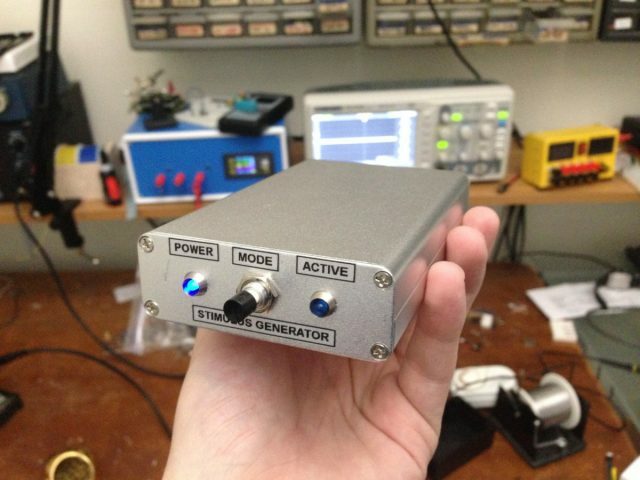 If a microcontroller is already being used, consider Make’s write-up on the subject, and I think personally I would go with a transistor-based avalanche nosie generator to create the randomness. A major limitation is that irregularly spaced action potentials have slightly different amplitudes. I found this out the next day when I created a hardware random number generator (yes, that happened) to cause it to fire regularly, missing approximately half of the action potentials. When this happens, breaks in time result in a larger subsequent action potential. There are several ways to get around this, but it’s worth noting that the circuit shown here is best operated around 6 Hz with only continuous regularly-spaced action potentials. 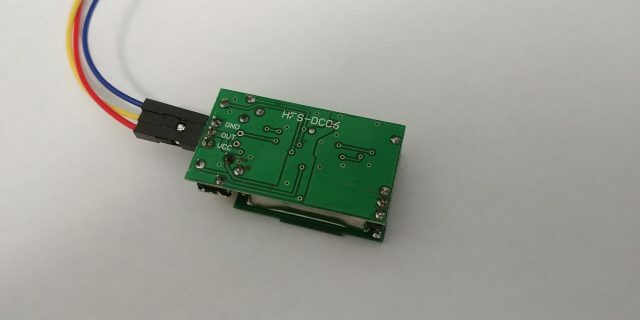 In the video I also demonstrate how to record the output of this circuit using a high-speed (44.1 kHz) 16-bit analog-to-digital converter you already have (the microphone input of your sound card). I won’t go into all the details here, but below is the code to read data from a WAV file and plot it as if it were a real neuron. The graph below is an actual recording of the circuit described here using the microphone jack of my sound card. Let’s make some noise! 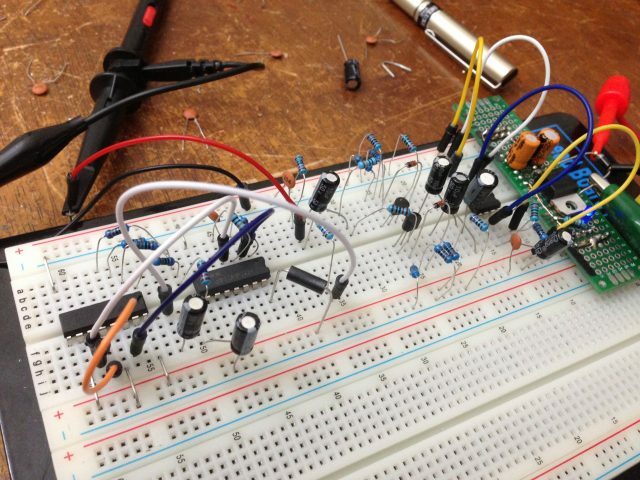 Just to see what it would look like, I created a circuit to generate slowly drifting random noise. 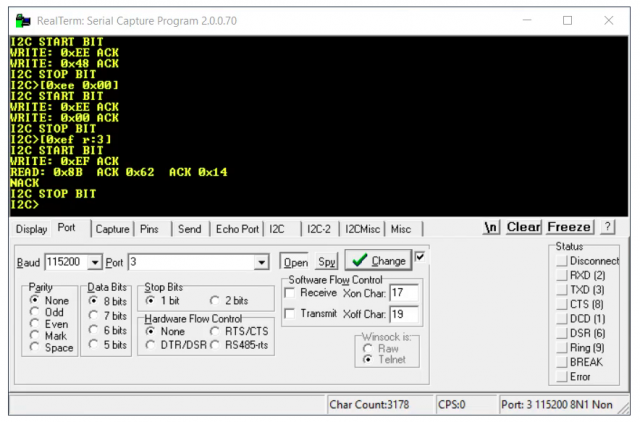 I found this was a non-trivial task to achieve in hardware. 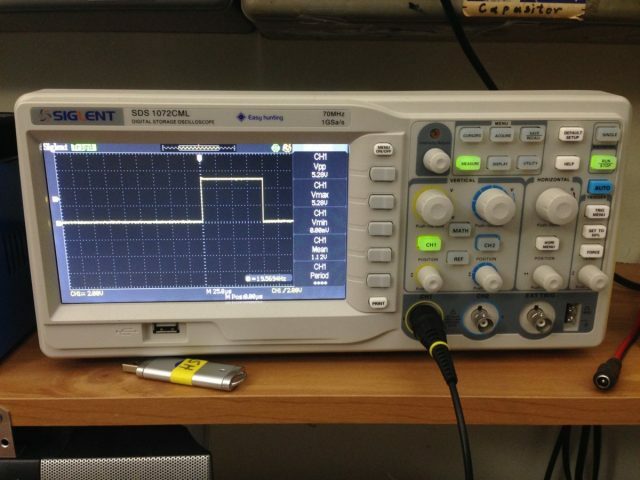 Most noise generation circuits create random signals on the RF scale (white noise) which when low-pass filtered rapidly approach zero. 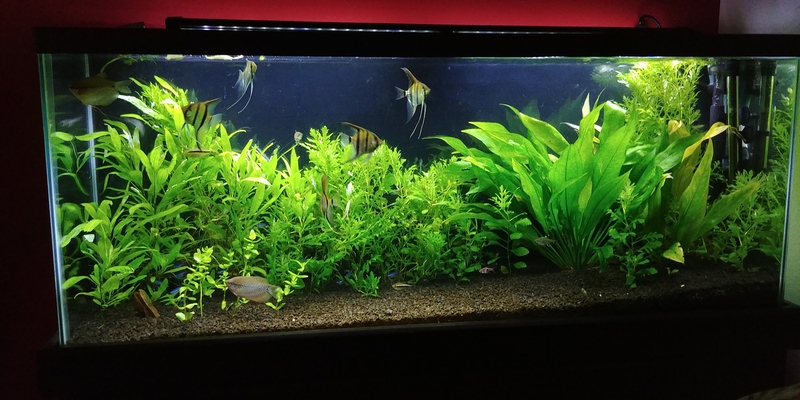 I wanted something which would slowly drift up and down on a time scale of seconds. 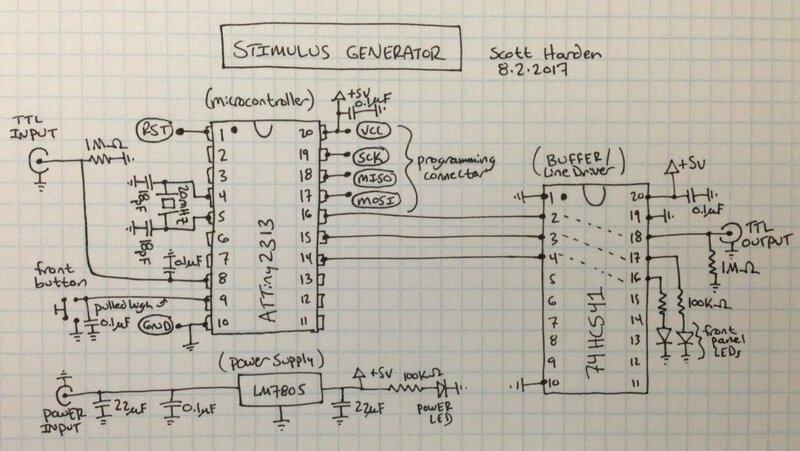 I achieved this by creating 4-bit pseudo-random numbers with a shift register (74HC595) clocked at a relatively slow speed (about 200 Hz) having essentially random values on its input. 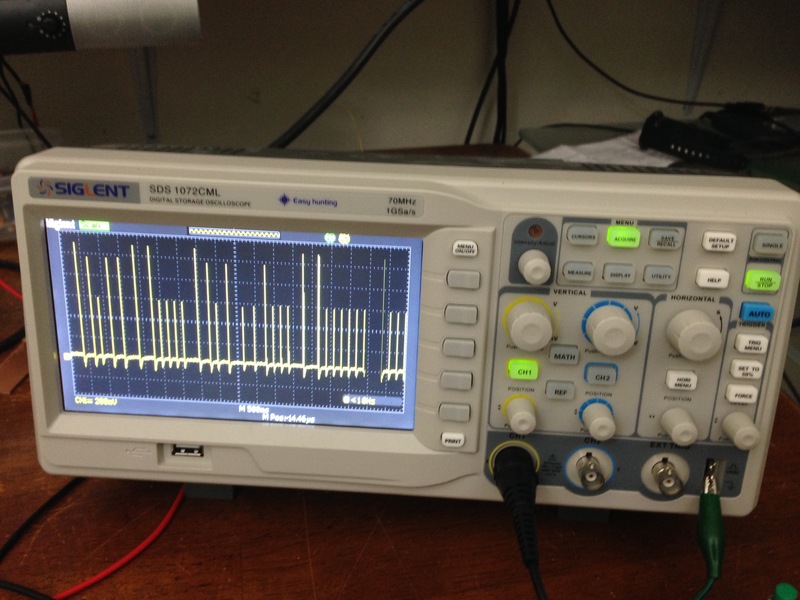 I used a 74HC14 inverting buffer (with Schmidt trigger inputs) to create the low frequency clock signal (about 200 Hz) and an extremely fast and intentionally unstable square wave (about 30 MHz) which was sampled by the shift register to generate the “random” data. The schematic illustrates these points, but note that I accidentally labeled the 74HC14 as a 74HC240. 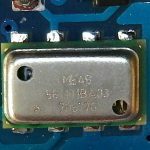 While also an inverting buffer the 74HC240 will not serve as a good RC oscillator buffer because it does not have Schmidt trigger inputs. The addition of noise was a success, from an electrical and technical sense. It isn’t particularly physiological. Neurons would fire differently based on their resting membrane potential, and the peaks of action potential should all be about the same height regardless of the resting potential. However if one were performing an electrical recording through a patch-clamp pipette in perforated patch configuration (with high resistance between the electrode and the internal of the cell), a sharp microelectrode (with high resistance due to the small size of the tip opening), or were using electrical equipment or physical equipment with amplifier limitations, one could imagine that capacitance in the recording system would overcome the rapid swings in cellular potential and result in “noisy” recordings similar to those pictured above. 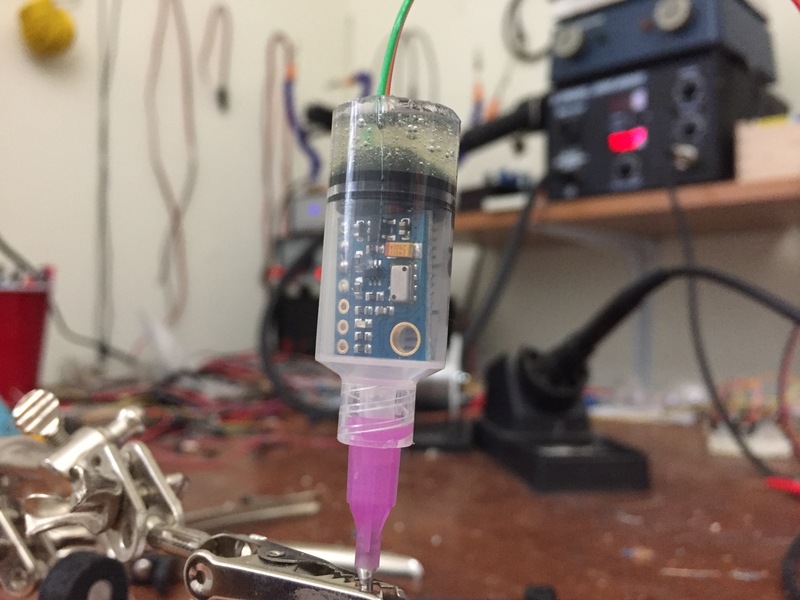 They’re not physiological, but perhaps they’re a good electrical model of what it’s like trying to measure a physiological voltage in a messy and difficult to control experimental environment. 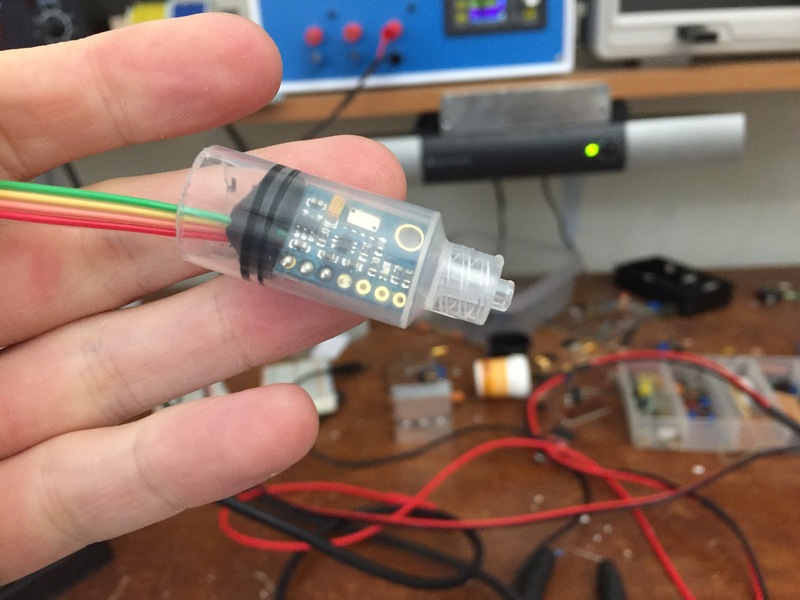 This project was an interesting exercise in analog land, and is completed sufficiently to allow me to move toward my initial goal: creating advanced action potential detection and measurement circuitry. There are many tweaks which may improve this circuit, but as it is good enough for my needs I am happy to leave it right where it is. 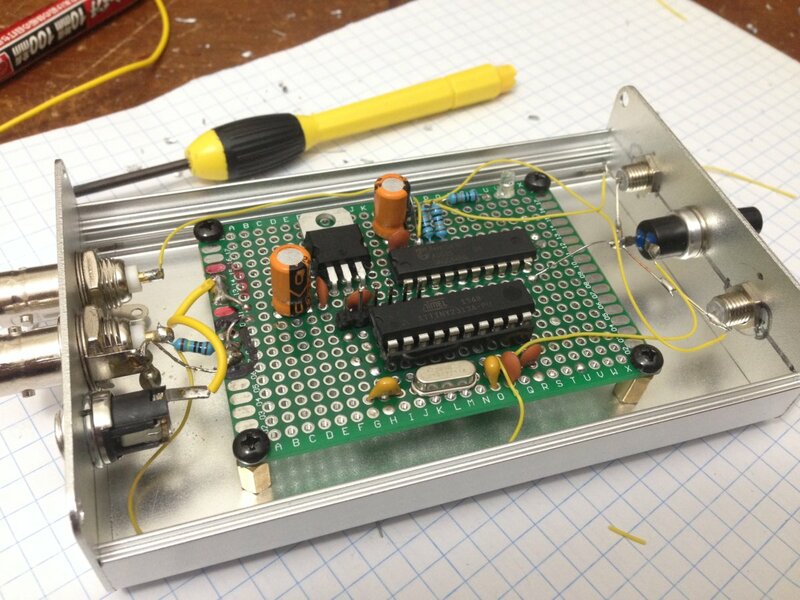 If you decide to build a similar circuit (or a vastly different circuit to serve a similar purpose), send me an email! I’d love to see what you came up with. 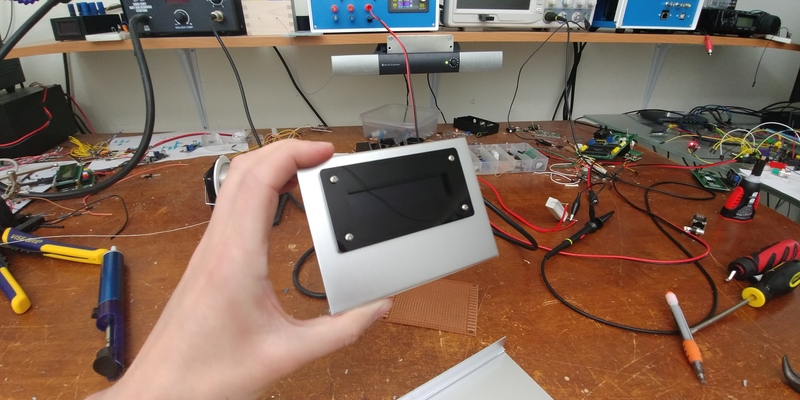 I just finished building a device that uses RADAR to toggle power to my speakers when it detects my hand waiving near them! 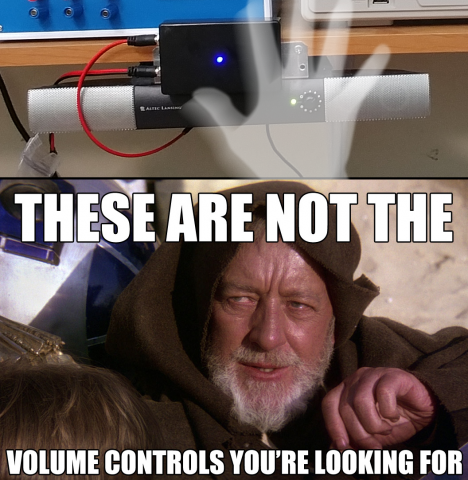 I have some crummy old monitor speakers screwed to a shelf, and although their sound is decent the volume control knob (which also controls power) is small and far back on my work bench and inconvenient to keep reaching for. I decided to make a device which would easily let me turn the speakers on and off without having to touch anything. You could built a device to detect a hand waive in several different ways, but RADAR (RAdio Detection And Ranging) has got to be the coolest! 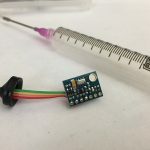 This project centers around a 5.8 GHz microwave radar sensor module (HFS-DC06, $5.22 from icstation.com, + 15% discount code haics) which senses distance (sensitivity is adjustable with a potentiometer) and in response to crossing a threshold it outputs a TTL pulse (the duration of with is adjustable with another potentiometer). 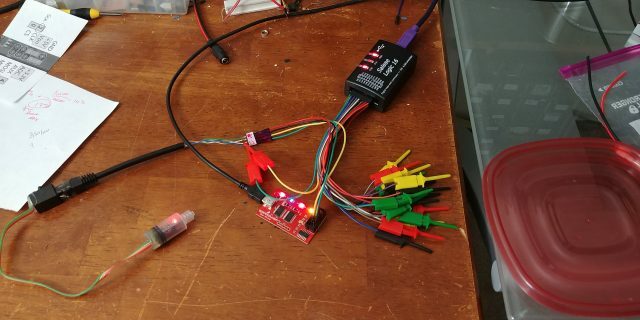 I ran the output of the module through divide-by-two circuit (essentially a flip-flop) so that an object-detect event would toggle a line rather than pull the line high for each detection. I didn’t have a cheap flip-flop IC on hand (the 74HC374 comes to mind, $0.54 on Mouser) but I did have a 74HC590 8-bit binary counter on hand ($0.61 on Mouser) which has a divide-by-two output. 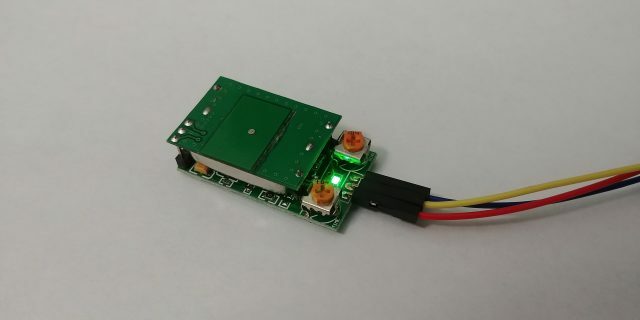 I used the radar sensor and this IC to produce a proximity-toggled TTL signal which enabled/disabled current flowing through a power n-channel MOSFET. 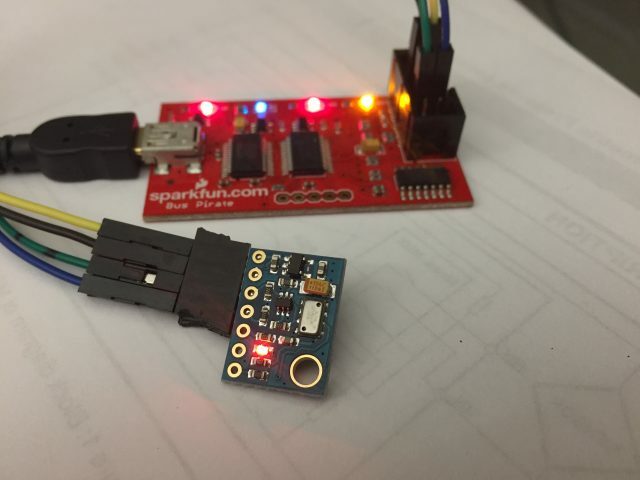 All together this let met create a device with two DC barrel jacks (an input and an output), and current delivery on the output could be toggled with proximity sensing. The back side of the module reveals the simplistic connections: VCC (5V), OUT, and GND. I wanted this device to be extremely simple, with a single input DC jack and single output jack and no buttons or knobs. 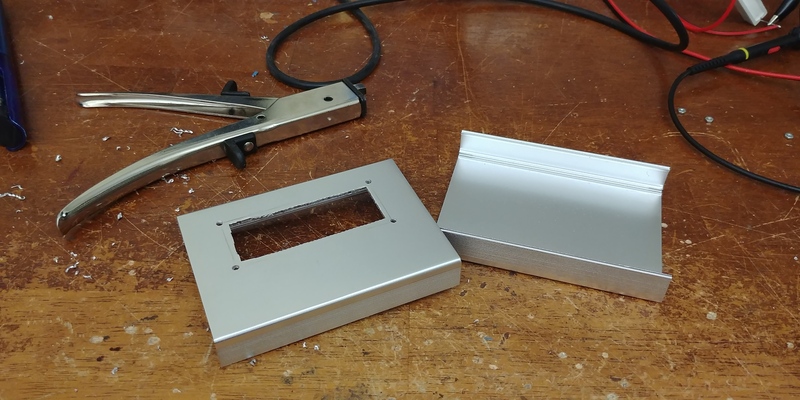 It’s a funny feeling making a user input device with no drill holes in the enclosure! The design is so simple it’s not worth reviewing in detail. 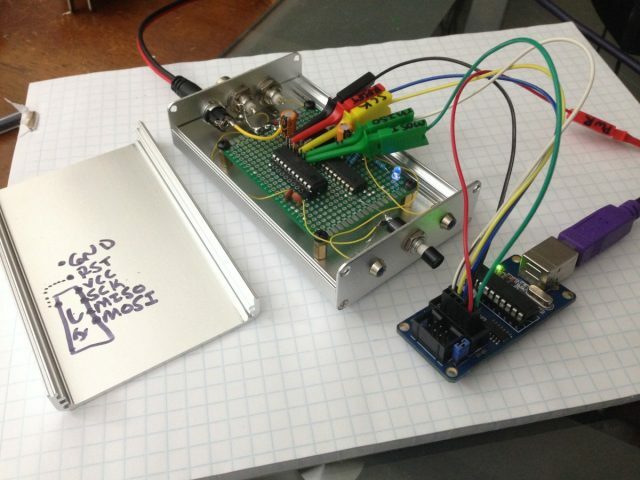 The 15V line (which in reality could be almost anything) is brought to 5V with a LM7805 linear voltage regulator. 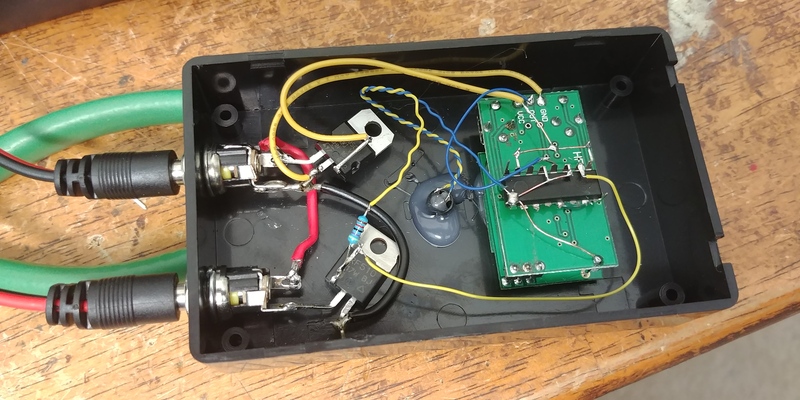 Decoupling capacitors are commonly placed on the input and output of the regulator, but since the function is to toggle a switch I didn’t find it necessary (there is no downstream signal I wish to preserve the integrity of). 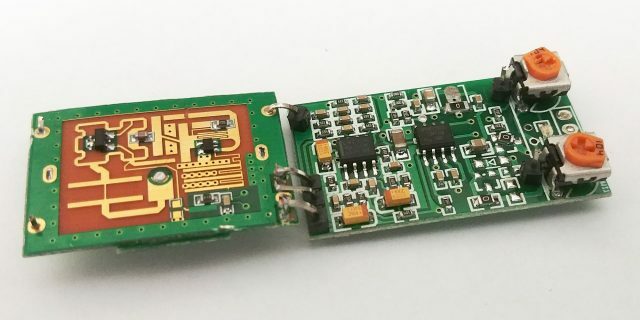 The radar module has only 3 connectors: +5v, GND, and OUT. Out produces a high pulse when it detects something close. 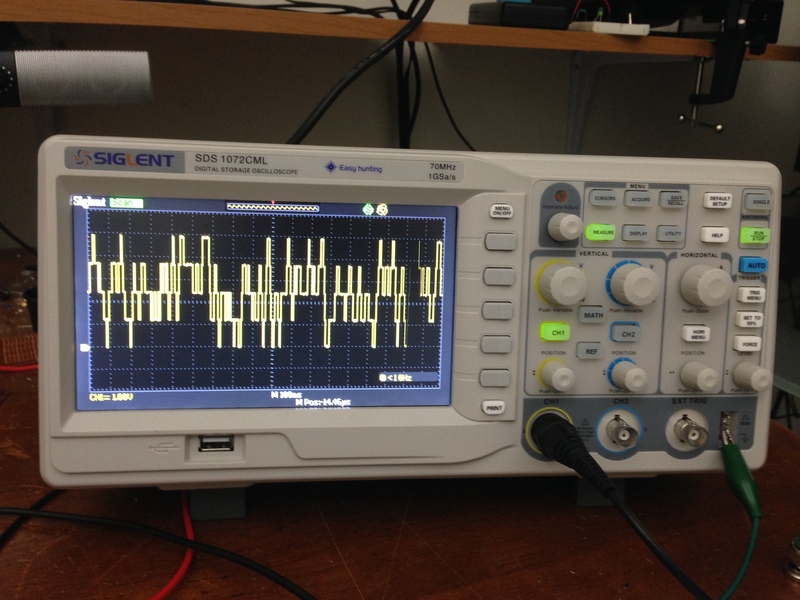 The output of the OUT signal is fed into a divide-by-two stage which is really just a 74HC590 8-bit binary counter taking output of the div/2 pin. 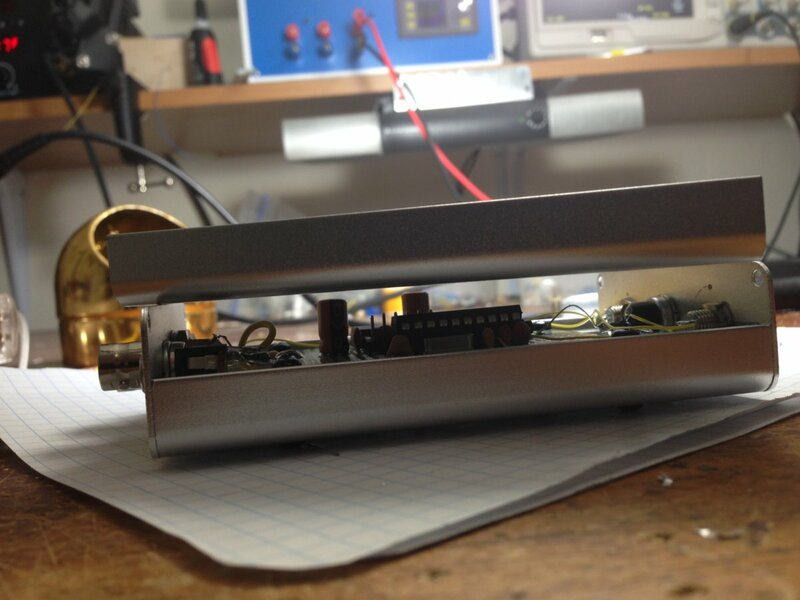 That output is fed into an IRF510 N-channel MOSFET to switch current flow on the “DC output” on and off. A Darlington transistor (i.e., TIP122) would probably work fine too, but there would be a slightly greater voltage drop across it. 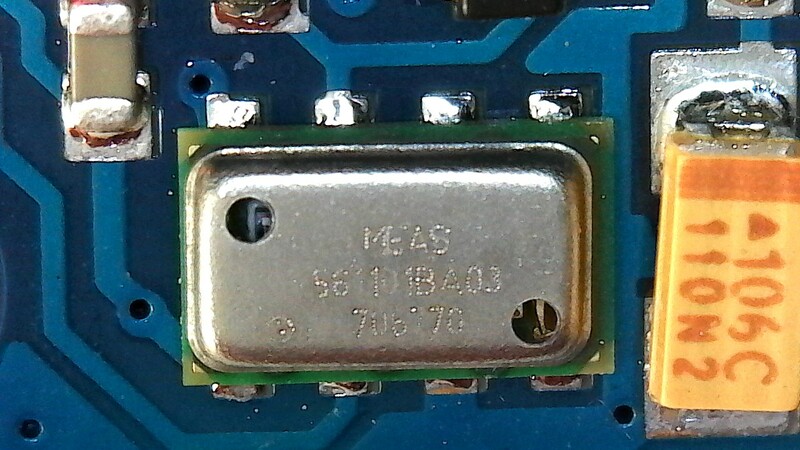 Any power MOSFET would have worked, but I had a box of IRF510s on hand so I used one although they are more expensive ($0.82 on Mouser). Not shown is a status LED which is also on the output of the divide-by-2 chip (with a current limiting series resistor). 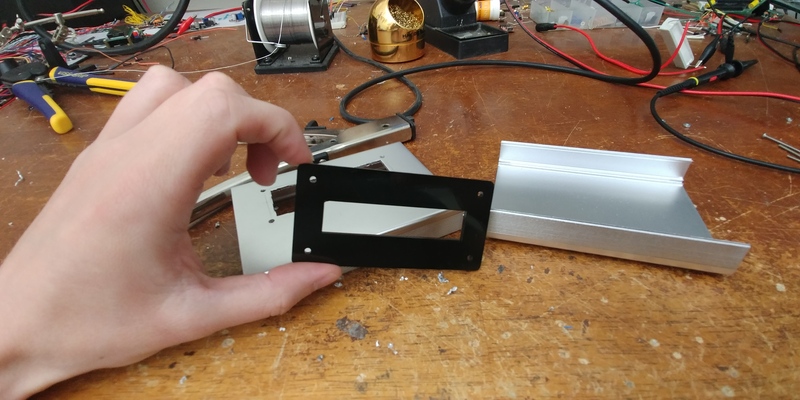 I glued the radar module to the wall of a plastic enclosure. 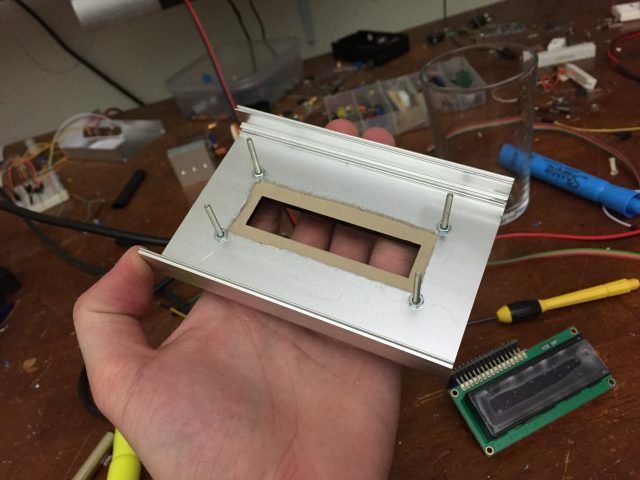 Isn’t radar messed-up by glue and plastic? Yes! But I’m not sensing things 50 feet away. I’m sensing a hand moving a few inches away. 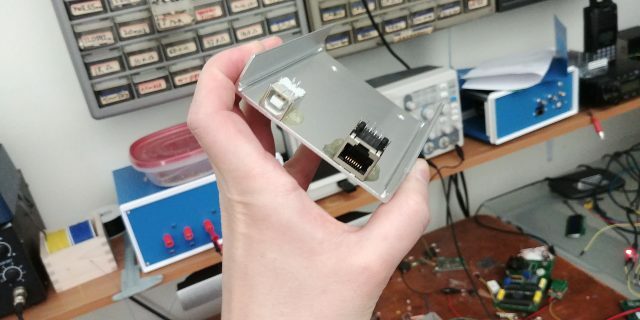 To this end, I experimented with how much glue and how thick plastic I needed to distort the signal enough so that it would only activate when I put my hand near it (as opposed to sitting down at my desk, which could also trigger the sensor without these attenuating structures). I found that aluminum tape further dampened the response, but luckily for the aesthetics of the build I didn’t have to use it. 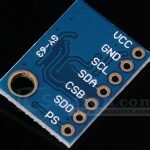 Also, rather than take time making a PCB (or even using perfboard), I found point-to-point construction quite sufficient. 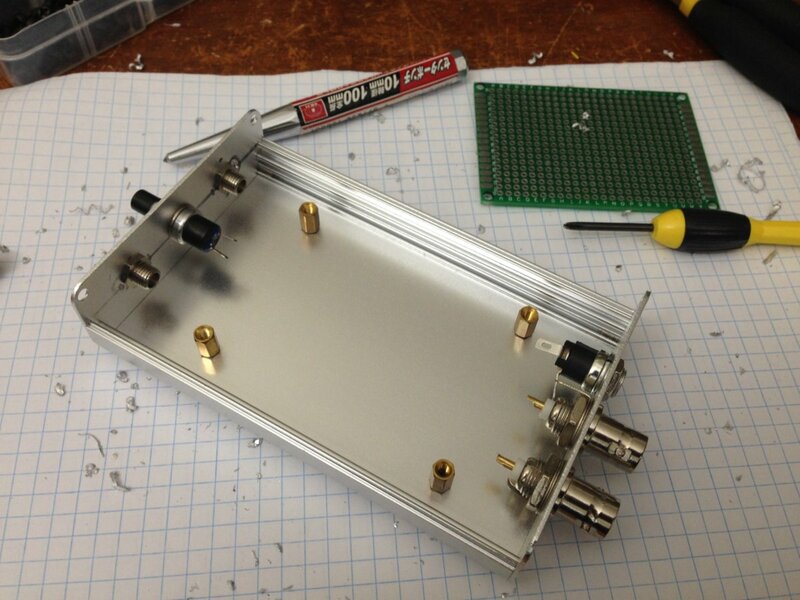 I hot glued the counter IC to the radar module, wired it all together, and it was done! 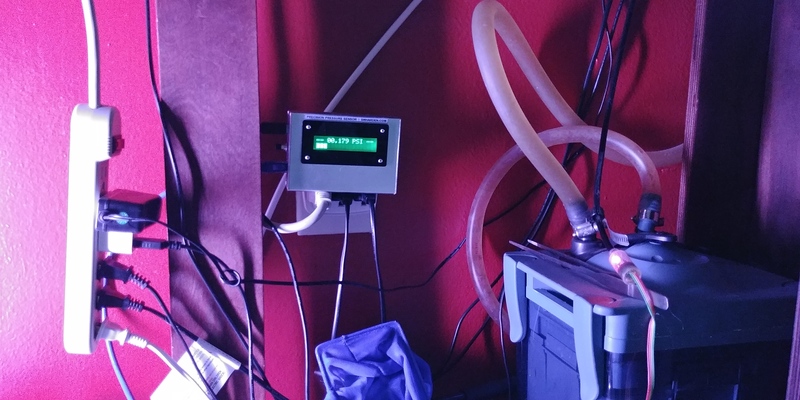 A little black plastic LED bezel was a nice touch with the diffuse blue LED. 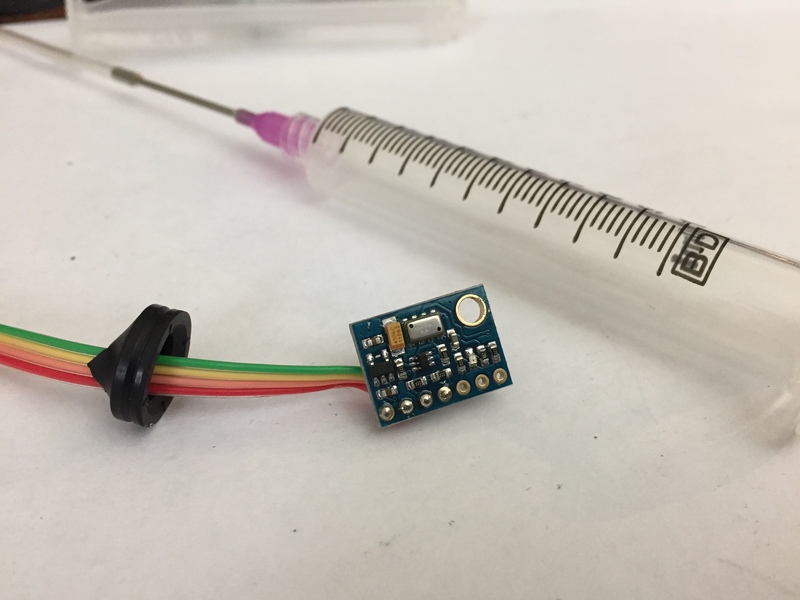 IR (infrared) – By pulsing IR and sensing the reflected signal intensity with an IR-filtered photo-transistor, you could invisibly detect presence of an object in front of the sensor. Adjusting the amplification of the photo-transistor (and/or diffusion of its lens or enclosure) could adjust for distance. In fact, many companies make paired IR-LED / IR-phototransistor modules specifically for this task. However, if you have a TV remote control or other device which uses IR to communicate, it could screw with this signal. Sonar – Instead of light, pressure waves (sound) could be used to sense distance due to the time delay between an audio emission and detection of its reflection. Presumably an ultrasonic transducer would be used to prevent perpetual annoyance of those living in the area. 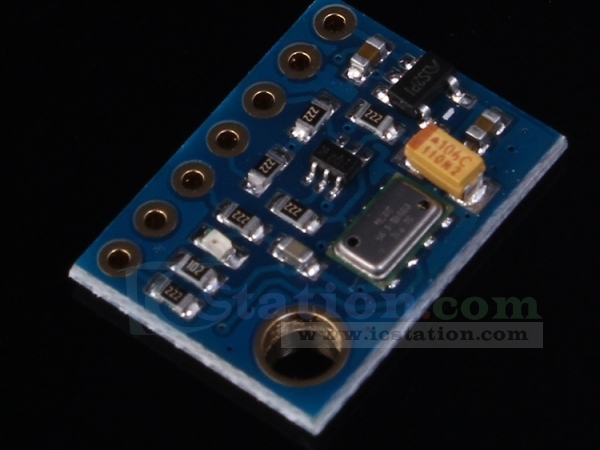 Ultrasonic distance sensor modules can also be found online for this purpose. These technologies are what is commonly used by vehicles to detect objects in their path while backing-up, alerting the driver with a beep. The downside of this method is that it would not work inside an enclosure. Aesthetically, I didn’t want to have two silver screen-covered cans staring at me. 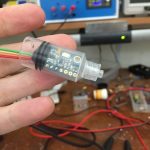 I had two of these modules on hand, so after I got this project working with one I used the other to conduct a destructive teardown. What I found inside was interesting! If someone were really interested, there may be some potential for hackability here. 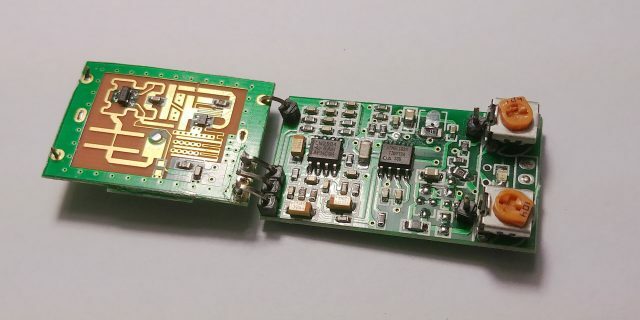 Aside from the microwave PCB goodness I found two primary ICs: the LM2904 dual op-amp and an ATTiny13 8-bit microcontroller. 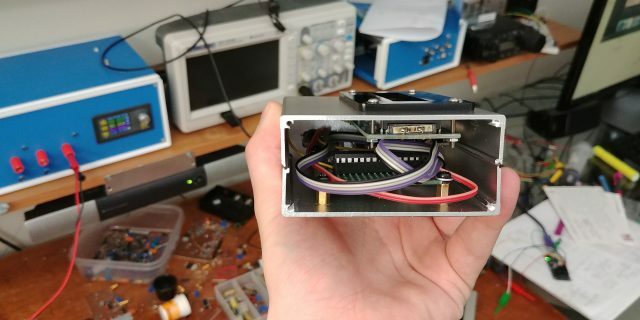 I was really surprised to find a microcontroller in here! With so much analog on these boards, it seemed that a timed pulse could be accomplished by a 555 or similar. 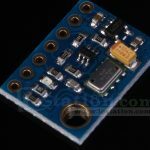 A single-quantity ATTiny13 is $0.58 on Mouser (as compared to $0.36 for a 555) but maybe when you add the extra discrete components (plus cost of board space) it makes sense. 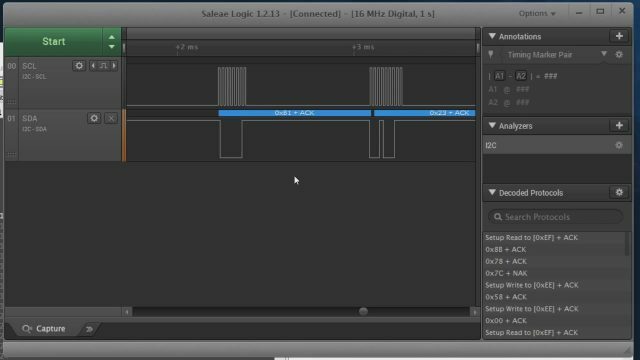 Also, I’m not entirely sure how this circuit is sensing distance and translating it into pulses so perhaps there is some more serious computation than I’m giving it credit for. 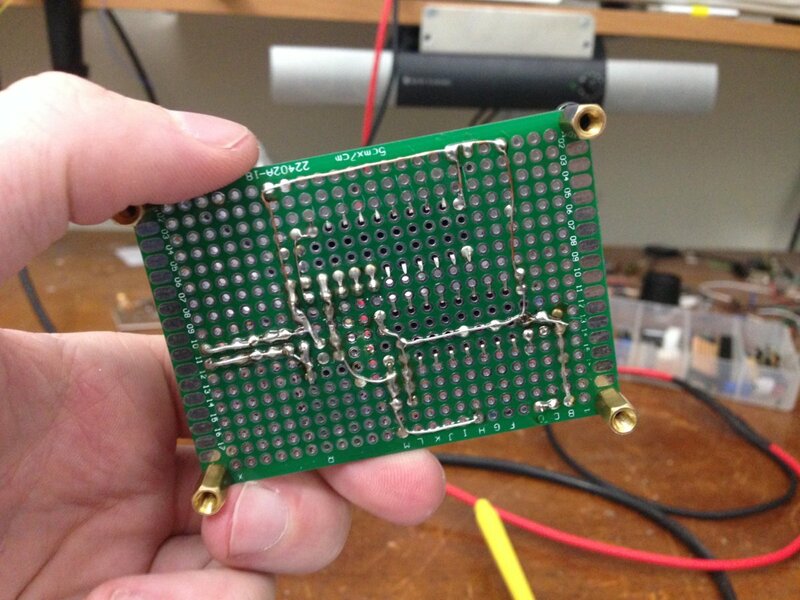 look at that microwave PCB design! 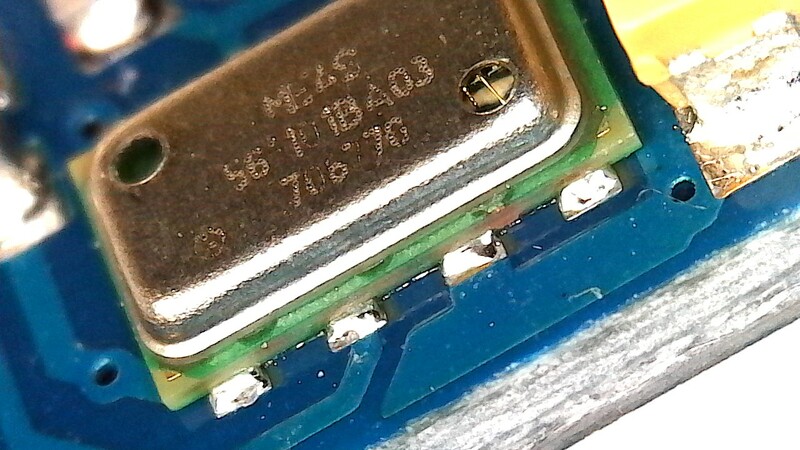 The presence of an ATMEL AVR in this RADAR module is a potential site for future hacks. I’d be interested to solder some wires to it and see if I could extract the firmware. In any large scale commercial products the read/write access would be disabled, but with small run modules like this one seems to be there’s a chance I could reprogram it as-is. If I really wanted to use this layout but write a custom program for the micro I could desolder it and lay my own chip on the board. For now though, I’m really happy with how this project came out!